Featured amenities include luggage storage and laundry facilities. A ferry terminal shuttle is available for a surcharge. Located in Koh Phangan, J.B Hut Bungalow is within a 15-minute drive of Salad Beach and Koh Ma. 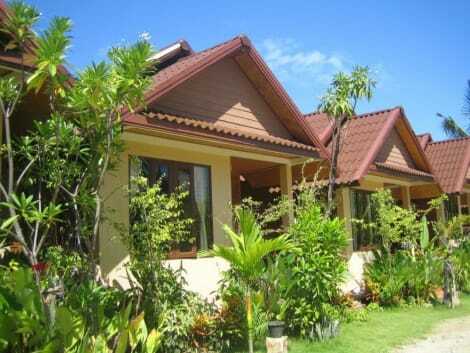 This guesthouse is 2.6 mi (4.2 km) from Mae Haad Beach and 6.5 mi (10.5 km) from Thong Sala Pier. For a surcharge, guests may use a roundtrip airport shuttle (available on request) and a ferry terminal shuttle. With a stay at Orchard House in Koh Phangan (Baan Kai), you'll be minutes from Ban Thai Beach and close to Haad Rin Nai Beach. This guesthouse is within close proximity of Thongsala Walking Street and Phaeng Waterfall.Rooms Make yourself at home in one of the 6 guestrooms. Rooms have private balconies. Complimentary wireless Internet access is available to keep you connected. Bathrooms have showers and complimentary toiletries.Dining Breakfast is available for a fee.Business, Other Amenities The front desk is staffed during limited hours. Limited parking is available onsite.